The natural goodness of Simply rapeseed oil includes Omega 3 & 6 and Vitamin E. Nutritionally it is also good to know that our oil has half the saturated fat of olive oil making it a healthier choice when it comes to cooking. The producer’s family has been farming in North Cornwall for generations and they are still involved in every aspect of Simply Oil ‘from seed to bottle’, with the exception of the bees borrowed from local bee keepers which pollinate the crop. 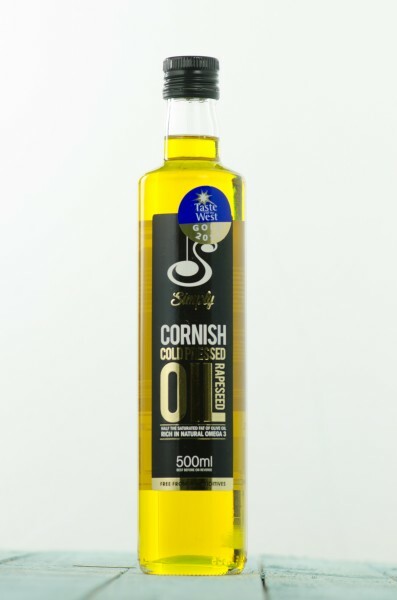 Simply Oil is made exclusively from rapeseed grown on their farm and they ensure the rapeseed is perfectly ripe when we harvest it, and so capture all the goodness that comes from Cornwall’s Atlantic air and fertile ground. The press is on the farm and the pressing process can’t be hurried. The fresh golden oil is filtered and left to settle for at least 7 days before being quality tested (tasted!) and bottled.